The Lord’s church continues to be plagued by those who promote the use of instrumental music in worship. While one might think this issue had been settled long ago, it continues to be a divisive matter. The Gospel Advocate Co. is republishing a wonderful resource tool that provides both sound biblical teaching as well as historical material to help one fully understand why vocal music is the only worship God authorizes and accepts. 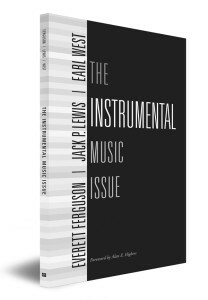 The Instrumental Music Issue contains three discussions presented in 1987 at the then Harding Graduate School of Religion (now Harding School of Theology). The reasons I find this book to be so valuable, not just for elders and ministers but for all Christians who want to stay informed on this issue, include the following. First, the writers are Jack P. Lewis, Earl West, and Everett Ferguson, men highly respected in our brotherhood for their outstanding scholarship. However, scholarship never gets in the way because the book is easily read and understood. The book tackles the issue of instrumental music from three standpoints: exegesis, the Restoration Movement, and the early church. These three men leave no stone unturned in presenting the truth. The reader will find passage after passage dealt with thoroughly. Whether looking at the voices of the Restoration Movement or the early church, numerous quotations are provided from both arenas to show how men stood against instrumental music. Finally, issues and arguments are dealt with fairly and objectively, with no evasive maneuvers just to try to prove a point. Even when an opposing view is given, each man masterfully exposes why it cannot stand the test of truth. This book will be a welcome addition to every Christian’s library.